I’ve noticed that many people consider the Atonement as Christ’s time on the cross. We can only begin to imagine his agony. However, we can easily comprehend the concept that He did indeed suffer greatly for our sins while on the cross. It was a physical pain the likes of which makes us all shudder. But, the cross was actually the completion of his sacrifice; the completion of the Atonement. I don’t mean to minimize His suffering or his willingness to make this sacrifice. I know He endured great agony. And he did it for us. While in the Garden of Gethsemane, however, His agony was so much more than we can ever understand. It’s a kind of pain that is beyond our comprehension. And this is where the most important element of the Atonement actually took place. As I said before, giving up his life was the completion of the Atonement. The Garden of Gethsemane was where he actually paid the price for our sins. I think many people concentrate on his time spent on the cross as the Atonement because it is easier to relate to his pain and suffering while there. The pain the Savior suffered in the Garden of Gethsemane is nearly unfathomable. In the Garden of Gethsemane, the Savior actually took upon himself the sins of the world. He made it possible for us to return to our Father in Heaven, clean and pure, if only we will repent of our sins. He has taken on the punishment for our sins, so that we don’t have to–again, if we repent and change our lives. When the plan for our salvation was presented to us in the premortal spirit world, we were so happy that we shouted for joy (see Job 38:7). We understood that we would have to leave our heavenly home for a time. We would not live in the presence of our Heavenly Father. While we were away from Him, all of us would sin and some of us would lose our way. Our Heavenly Father knew and loved each one of us. He knew we would need help, so He planned a way to help us. We needed a Savior to pay for our sins and teach us how to return to our Heavenly Father. Our Father said, “Whom shall I send?” (Abraham 3:27). Jesus Christ, who was called Jehovah, said, “Here am I, send me” (Abraham 3:27; see also Moses 4:1–4). Jesus was willing to come to the earth, give His life for us, and take upon Himself our sins. He, like our Heavenly Father, wanted us to choose whether we would obey Heavenly Father’s commandments. He knew we must be free to choose in order to prove ourselves worthy of exaltation. Jesus said, “Father, thy will be done, and the glory be thine forever” (Moses 4:2). By eternal law, mercy cannot be extended unless there be one who is both willing and able to assume our debt and pay the price and arrange the terms for our redemption. Many have a hard time comprehending why there needed to be an Atonement. 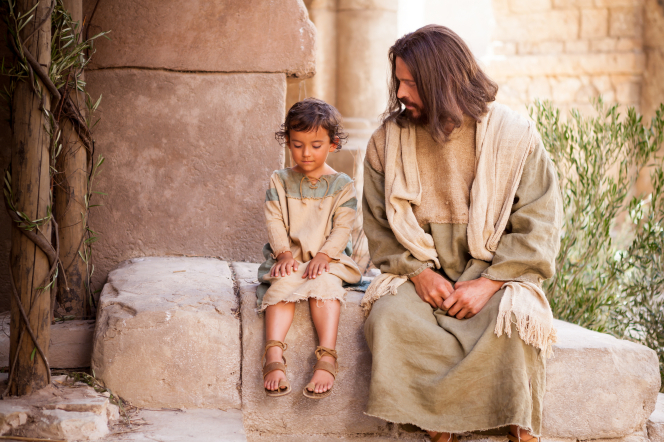 The best way to describe what the Savior has done for us is through this story, an analogy shared by Elder Boyd K. Packer. There once was a man who wanted something very much. It seemed more important than anything else in his life. In order for him to have his desire, he incurred [took on] a great debt. He had been warned about going into that much debt and particularly about his creditor, the one who lent the money. But it seemed so important for him to have what he wanted right now. He was sure he could pay for it later. The creditor was always somewhere in the back of his mind, and he made token [small] payments now and again, thinking somehow that the day of reckoning [the day he had to repay all the money] would never really come. But as it always does, the day came and the contract fell due. The debt had not been fully paid. His creditor appeared and demanded payment in full. Only then did he realize that his creditor had not only the power to repossess [take away] all that he owned but also the power to cast him into prison as well. There they were: One meting out justice, the other pleading for mercy. Neither could prevail [win] except at the expense of the other. “If you do not forgive the debt, there will be no mercy,” the debtor pleaded. Both laws, it seemed, could not be served. They are two eternal ideals that appear to contradict one another. Is there no way for justice to be fully served and mercy also? The law of justice can be fully satisfied and mercy can be fully extended—but it takes someone else. And so it happened this time. And so it was that the creditor was paid in full. He had been justly dealt with. No contract had been broken. The debtor, in turn, had been extended mercy. Both laws stood fulfilled. Because there was a mediator, justice had claimed its full share and mercy was fully satisfied. Our Mediator is Jesus Christ. I hope that story helped you to understand the need for an Atonement. It gives me clarity concerning this very important facet of the gospel. May we each make use of Christ’s gift to us, the Atonement, on a daily basis. How grateful I am for even my small comprehension of the atonement. I do believe that all can be made right through that redemptive power. Thank you for the beautiful reminder. I love this post, Taylor. I’ve been reading “The Infinite Atonement” by Tad Callister and the subject is so deep and powerful. I’m overwhelmed by the love of our Savior and how truly in debt we are to Him. It makes me so grateful, and when I truly ponder His sacrifice, I don’t want to do anything bad (just to show my gratitude for saving me). This is such a beautiful post. Thank you for sharing your testimony and thoughts. Just today I was thinking about how sometimes I’m “coasting” during the Sacrament. I need to really use that time for what it is meant for, not just a nice quiet time, but a time to ponder and to ask Heavenly Father for forgiveness for my shortcomings, and “what lack I yet?” I know that as I do, He will help me to know little by little, by degrees, what I can do to come closer to Him. Thank you!